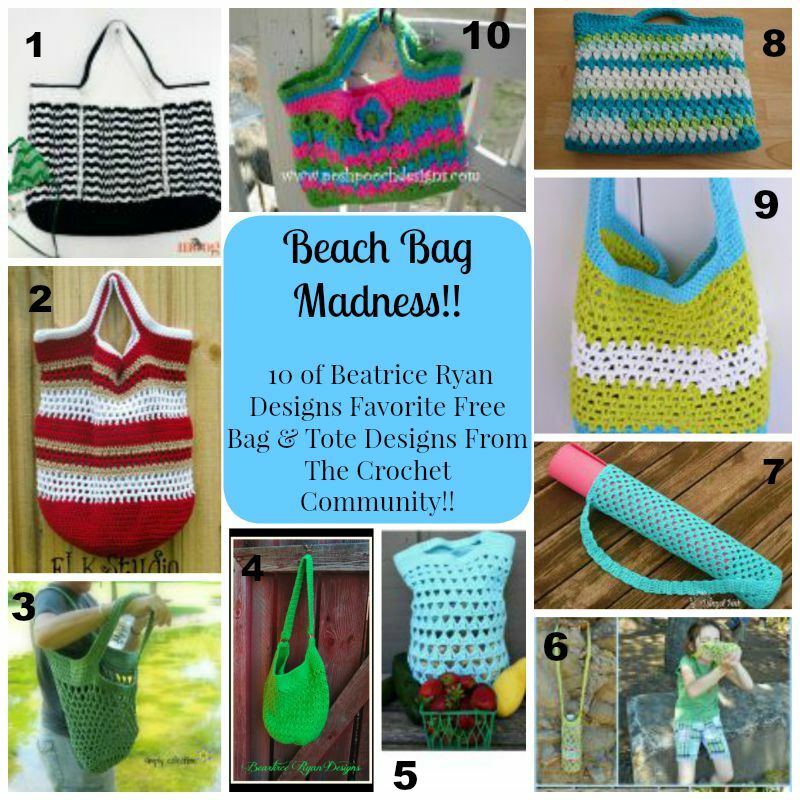 Beach Bag Maddness… 10 Free Crochet Patterns!! Beach Bag Madness!! 10 of my favorite free bag and tote patterns from around the crochet community!! Do you love Totes and Bags… So do I!! I have collected 10 of my Favorite Free Crochet Patterns from around the crochet community… If you are ready to head to the beach or just go to the market,,, I know you will love making one of these projects!! Enjoy!! 1. Moogly ~ Day at the Beach Bag! This fun and stylish bag is a must for this summers beach!! 2. ELK Studio ~ Fun in the Sun Beach Bag!! You could definitely have fun in the sun this summer using this beach bag!! 3. Simply Collectible Crochet ~ Sturdiest Ever Market Bag! Fun and easy, this bag would be perfect for the beach!! 4. Beatrice Ryan Designs ~ Amazing Grace Tote Bag! Tote all you fun summer items to the beach in this fun bag! 5. Cre8tion Crochet~ Triangle Stitch Market Bag!! The Triangle Stitching pattern reminds me of beach waves! 6. Jessie at Home ~ Water Bottle Sling! Make sure to carry your water with you to the beach using this bag! 7. Danyel Pink Designs ~ Yoga Mat Tote Bag! For those of you who would love to do yoga on the beach!! 8. Crochet Memories ~ Cluster Tote Bag! Very bright and cheery for the beach!! 9. The Stitchin Mommy ~ Summer Fun Beach Tote! Yes, Fun at the beach!! 10. Posh Pooch Designs ~ Kitties in a Row Tote Bag!! For the little girl in your life to take to the beach!! Simply August Boho Bag CAL..Week 1 Instructions!! !